Any cytotoxic T lymphocyte (CTL) will kill P815 or EL4 target cells on addition of a lectin such as phytohemagglutinin (PHA) or concanavalin A (Con A) (1,2), and lectin-dependent killing has been considered a prerogative of CTL (3). However, lectin-dependent killers could be found under conditions where no specific CTL were induced (4–6), and nearly every T cell clone stimulated by Con A and T cell growth factor (TCGF) caused 51Cr-release in the presence of PHA (7). 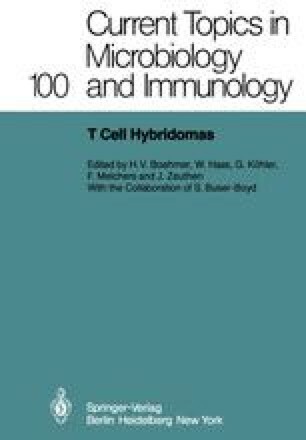 It therefore seemed possible that any T cell can become a lectin-dependent killer. To find out how common this activity might be, we tested a set of antigen-specific, I-A-restricted T helper cell lines, clones and hybridomas (8–10).